“Sisters and Brothers of America” with these words of swami Vivekananda, India’s message of universal brotherhood reverberated across the world” Chicago address of Swamiji in the parliament of world religion on September 11, 1863. “ Sisters and brothers of America is celebrated every year as universal Brotherhood day in the world. As per the excellencies of the universal brotherhood day, it was celebrated on 11th September 2018 in our school premises. A mammoth procession was started at the waving of flag by Man. Radha Didi, Dhakshi Pranth Sankatak, Vivekananda Kendra, Kanyakumari, Man. Aparna Didi, All India Vyavastha Pramukh was in the forefront. The procession was started from Vallioor Murugan temple and ended at Vivekananda Kendra Vidyalaya which went through Perumal kovil, Vallioor Main road. The students’ band music was excellent. Swamiji’s inspiring thoughts and slogans were highlighted and echoed at the procession in which nearly 1050 students participated eagerly. Cultural programme was started at 2.30 p.m in our school premises. The programme was commenced with prayer song. All the dignitaries lighted the lamp. Our honourable chief guest was Sri. Natrajan D.E.O., Vallioor. Our special guest was Sri. Syed Ibrahim Deputy Inspector, Vallioor. Man. Radha Didi, Man. Aparna Didi graced the function with their presence and blessings. An interesting dialogue between the students highlighted all the important incidents happened in Swamiji’s life while going to introduce the Hindu Vedanta in the parliament of world religion which held in America. The various programmes like Bharatham, dance, drama were performed by students. To commemorate the 125th Swamiji’s Chicago address we have conducted elocution competitions in many schools. Ramakatha dance was highlighted. Our chief guest Sri. Natarajan D.E.O. delivered a vibrant speech about universal brotherhood day. His interaction between the students was really interesting. He explained the difference between ‘ Teachers and Guru’ in his speech. Next Radha didi gave the wonderful speech. She also quoted Swamiji’s thought “Every soul is potentially divine”. 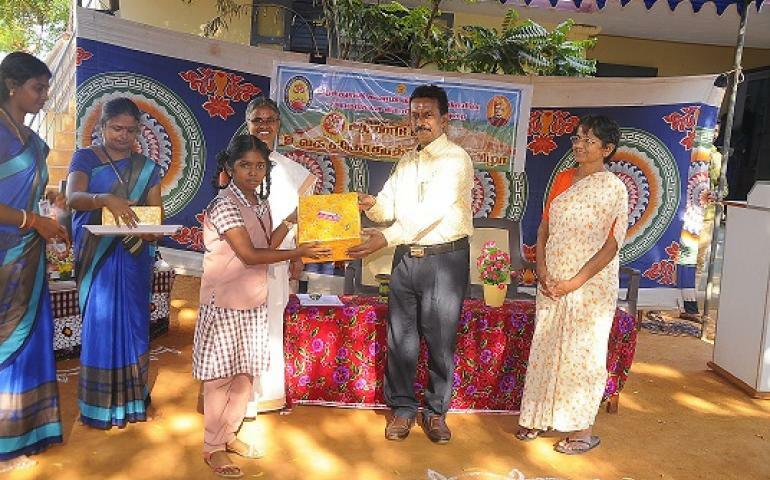 Next our chief guest distributed the prizes to the toppers in the elocution competition which was conducted among Vallioor school students . Nearly 220 parents and 1450 students participated in the celebration. Finally programme was ended by Shanthi Mantra. Our correspondent Sri. S K. Subramanian arranged the function a grand one. “Let us remember the words of Swami Vivekanand and dedicate ourselves to furthering the cause of unity, brotherhood and world peace”.